The ubiquitous mobile phones and social media have been providing the photographer enthusiastic with a platform to take and share their photos. Today, people take photos of everything and share it with everyone through instagram, whatsapp, flickr, facebook and other media. When the Admins of BEC announced that this week theme will be ‘snap and tell a story’, I decided to pick an old picture that might wow you and at the same time tell you an interesting and (I hope) a new story. The picture that I chose was taken during the Festival of India in Jakarta back in October 2009. At that time, the Indian Embassy in Jakarta organized a festival of India to show us a glimpse of the diverse cultures of India. To support the festival, the Indian Embassy in Jakarta brought cultural performers, including dance troupes and traditional musicians from all over India to Jakarta and if I am not mistaken, Bali. 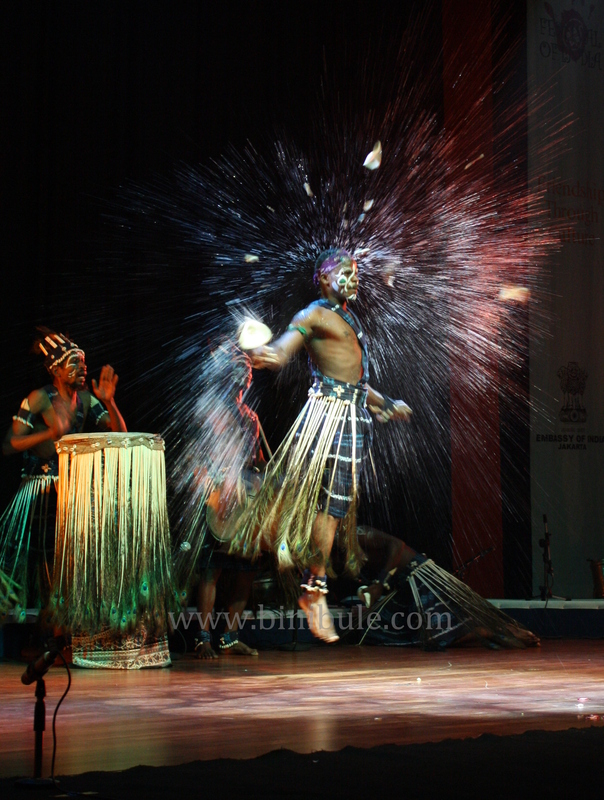 One of the dance troupes was called Sidi Goma Gujarat; the group was only consist of 5 tribal dancers and 4 drummers of East-African origin who has been living in Gujarat India since 8th centuries. All performers were men. I read that normally the group consists of 12 performers, including 8 dancers and 4 drummers. Sidi or Siddi means slaves, but there are those who argue that it means master. Back in the 8th Centuries, the Africans were brought to India as slaves, concubines or merchants. Due to their quality, they were also brought to India to do security related jobs, like soldiers, palace guards or personal body guards. Today, there are more than 30,000 Sidis lives in Gujarat and they are well known as a devout Sufi Moslem. Although Sidis, who are also known as Habshi, have successfully assimilated with their home country and speak the local language, they are often discriminated. This is due to their appearance, which does not have any Indian characteristic. In one of the articles that I read, the Sidi Goma performers were once accused of as Niger group who forged and travel with Indian passports. Sidis also often have to pay more than the local because the sellers think they are tourists, not local. According to theeastafrican.co.ke, Sidis are also stereotyped as “lazy, potentially talented in music and sports, but incapable of intellectual endeavor”. The dance and the sacred music of Sidi Goma Gujarat usually performed during rituals at the Shrines to Bava Gor, the patron Saint of the Sidi. During the performance, the dancers and the drummer were dressed in peacock feather skirt and their faces were painted. The peacock feather skirt is an Indian influence, while face paint is African. Contrary to what I thought, the dance was far from serious and very playful. They sang, danced and had fun like a group of ecstatic young boys. The humor was also at the heart of the dance; in one of the dance parts, they stuck out their tongues and posed for us. Unfortunately, I could not take good picture of them posing because I was sitting far from the center of the stage. At the end of the dance, one of the dancers tossed a coconut in the air and cracked is with his head. I snapped few pictures but my favorite one is when the dancer was in the air while the coconut broke and the water splashed all around his body. I was so thankful that I was far from the center stage. Had I sat in front of the center stage, I would have snapped a different picture; a less dramatic one.